Blurb- That day I realized I had lost her forever. I had lost her smile, her friendship, her voice… But still, somewhere in my heart, I believed her to be my girlfriend. My mute girlfriend.” Rohan is a telecom professional posted in Meerut and misses his girlfriend from college days, who had stopped interacting with him, without giving any reason. Although she had always stood by his side and her eyes reflected immense love, but she remained his mute girlfriend. The book opens with an SMS from Vaidehi to Rohan, after five long years. But before he could reply, his mobile gets damaged and he wanders in his memories to narrate a story. About how his girlfriend became his mute girlfriend after the first year of their engineering college. My Mute Girlfriend is a true romance story of how Rohan unravels the answers to why Vaidehi was mute for so long and how their life is about to change. But little do they know that the worst is yet to come. 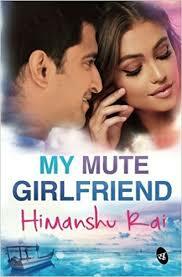 Review- My Mute Girlfriend is debut novel by Himanshu Rai. With his debut book, Himanshu serves us love-story of Rohan and his encounter with love and friendship. Book Cover and Title- Book Cover is appropriate with the content. However, it could be made more attractive. Title is appropriate with the book and creates suspense. Blurb is interesting and attracts readers. Language and Narration- Language of the book is lucid and rich in vocabulary. Narration of the book is a bit off-hook. Dialogs are crisp and short. However, there are some editing errors in the book which could be improved in the next edition. Characterization- Characters are justified properly with more or less depth given to every character which helps to make this story complex. Storyline and Plot- Storyline of the book is plain with few of twists and turns throughout the book to keep readers interested in the book. All the scenes are rightly places with exiting and fast paced story. However, Plot construction is commendable. Himanshu beautifully merges the relatable characters and the story. Overall, My Mute Girlfriend is an average story which serves us a beautiful and relatable characters with not-so-new plot.